November 30, 2017 Robert W.
Quality retractable banner stands in Las Vegas can be made quickly and efficiently locally in Las Vegas. Las Vegas is the number one destination for trade shows and events in the world. Millions of business people and vendors come annually to Vegas to participate in the many conventions and trade shows held almost daily in Las Vegas. In fact, Las Vegas has 3 of the top convention venues ( Mandalay Bay Convention Center, Sands Exposition Center and The Las Vegas Convention Center. ) www.VegasMeansBusiness.com or http://www.lvcva.com/ are great resources for information on conventions and the different venues. There are many sign companies in Las Vegas that are competing for your business and want to give you the best quality product and service as possible. Sign companies like www.Posterhead.com can make those quality banner stands for you, often in the same day. Many signs, banners and banner stands are need for the different event venues. Retractable banner stands ( also known as upright and pop up banner stands) are very popular at these events because they take up very little room, but yet offer a large display graphic that can stand alone. These retractable banner stands come in many different widths and heights and start off at less than $100.00. These banner stands are printed on a 13 ounce vinyl banner material with eco solvent inks that produce bright and vivid colors. All these banner stands come with an adjustable pole that allows for height adjustment on your banner stand. In addition, these banner stands come with a carrying case to make it easy to transport to different locations. Quality retractable banner stands in Las Vegas can be made by local sign shops that service the convention and trade show event industry. Contact one of these shops today and get that quality banner stand custom made for your event. Custom Clark County Air Quality dust permit signs are required by Clark County Air Quality Management. There information can be found at http://www.clarkcountynv.gov/airquality/Pages/ContactUs.aspx. or http://www.clarkcountynv.gov/airquality/Pages/About.aspx. Both these links will lead you to their website where you can find information regarding the requirement for compliance with their rules and regulations. Clark County Air Quality basically wants a 4ft x 4ft sign posted where dirt is being moved on 10 acres or less and a 4ft x 8ft sign posted for construction projects moving dirt involving over 10 acres of land. These signs are required to be certain size, certain language and text size is mandated by Clark County Air Quality. Companies like http://posterhead.com/dust-control-signs/ can get those signs made for you very quickly. 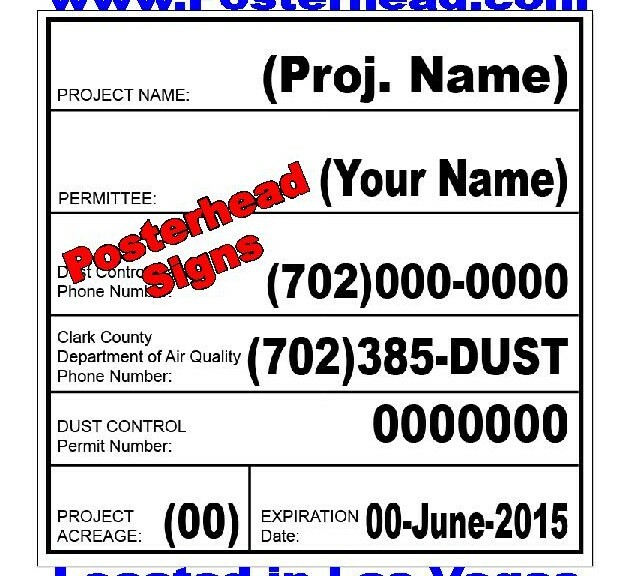 Las Vegas sign companies that make dust control signs usually use a double sided aluminum panel or mdo board to make the Clark County dust permit sign. Most construction companies like the aluminum sign because it is lightweight, easier to handle and does not weather like a wood sign. In addition, if the dust sign accidently gets damaged by the earth moving equipment, it can be straightened out rather than destroyed like a wood sign. Custom Clark County Air Quality Dust Permit Signs are not expensive and can be purchased at local sign companies for under $100 for the 4ft x 4ft sign and under $180.00 for a 4ft . x 8ft. dust permit sign. These signs can be made rather quickly ( same day in cases of emergency ), but normally take about 2 days to make and have ready for pick up. Sign companies can also help arrange the installation of the dust sign as well, although many construction companies will simply install it themselves as well as self home builders. It is not difficult to self install a dust control sign and can easily be done by one person. Quality dust signs cheap in Las Vegas Clark County are available very quickly in emergency cases. Sometimes things happen and contractors need a dust permit sign because someone forgot to order one and the darn thing was lost. ( This happens frequently) All the workers on the job site are ready to build and the city inspector asks where your dust sign is and stops the project. Fortunately, companies like www.Posterhead.com can make you a quality dust permit sign fast and inexpensively. The Clark County Air Quality Management ( Boulder City, Henderson, Summerlin, Paradise, Enterprise, North Las Vegas, etc)http://www.clarkcountynv.gov/airquality/Pages/ContactUs.aspx ) requires a 4ft. x 4ft. dust control permit sign for projects 10 acres or less and a 4ft. x 8ft. dust control sign for projects greater than 10 acres or more where dirt is going to be moved. The purpose of this is to try to lessen the dirt let into the air that Southern Nevadans breathe . The 4ft x 4ft sign costs less than one hundred dollars and the 4ft x 8ft dust sign costs around $175.00. These signs are a double sided aluminum ( so that it withstands the weather conditions of Las Vegas ) and will last the length of your construction project. Contractors like these aluminum signs because they are lightweight, but yet sturdy. In cases where the dust control sign is damaged ( run over by large equipment- which happens frequently ) , the dust sign is merely straightened out and placed back up for viewing. They used to make the signs out of wood, but contractors now prefer the newer aluminum dust control signs because of the cost and being of better quality. Quality dust signs cheap in Las Vegas Clark County can be found at quality sign companies in the Clark County area. Since the requirements on the Air Quality Managment dust sign are particular, make sure you choose a qualified sign company to produce your dust sign. Getting a Clark County dust control sign can be found at http://posterhead.com/dust-control-signs/. These signs are required by Clark County Air Quality Management Board for the purpose of regulating the dust that goes into the air at construction sites when dirt has to be moved. Las Vegas officials take dirt moving very seriously , as it pertains to the air we breathe in the Las Vegas area. Clark County requires a dust permit sign the size of a 4ft. x 4ft. for construction projects involving 10 acres of land or less. These dust signs are required to have certain language on the sign as well as text requirements of size. For construction projects more than 10 acres, a 4ft . x 8ft. sign is required . The cost of a 4ft x 4ft sign is under $100 and the cost of a 4ft x 8ft dust control sign is $175.00. These dust signs are made with a rigid aluminum panel that is lightweight and yet very strong. Contractors like the aluminum sign because it handles the Las Vegas weather very well and it is easy for one person to install. Also, very often the sign will get damaged during the construction process by a large piece of machinery ( bulldozer or earth mover) and the sign can be straightened and reinstalled. With a wood sign, it just breaks into pieces. These signs generally take just a day or so to make and be ready for installation. Clark County dust control class schedule dust signs are available at many of the sign shops that make construction signs. November 28, 2017 Robert W.
Fast cheap banners in Henderson Nevada is possible through local sign companies. One such sign company www.Posterhead.com can print those signs and banners very fast, often the same day if necessary. Fast cheap banners in Henderson are printed on a 13 ounce vinyl banner material with eco solvent ink. Instead of the old cmyk ink system where colors are made using yellow, black, blue and magenta, the newer printers ( that are much faster and accurate) use the 8 color system to mix inks to make your design and sign more bold and vibrant. The inks at printed on your banner material, then the banner is hemmed ( for perimeter reinforcement) and then grommets are placed strategically on the banner every 2 feet ( top and bottom) so that it can be attached securely for display. Fast cheap banners in Henderson Nevada are around $2.00 a square foot. This price includes full color ( meaning you can have as many colors on the banner as you like, as well as pictures, logos, etc.) hemming and grommets on your banner. If it is a simple design, that is included as well. These banners are printed on large format printers capable of printing several hundred square feet of banner an hour with amazing quality. Since these large format printers do most of the work so quickly, the cost of producing the vinyl banners has dropped and that drop in production cost is reflective in the drop of prices to the consumer. Many times these vinyl banners can be printed the same day at no additional charge if production allows. If overtime needs to be paid for a rush order, there may be an additional charge for printing the banner because of the extra costs. Fast cheap banners in Henderson are available at many of the finer sign shops locally and in Las Vegas. Banner stands in 48 hours or sooner in Las Vegas is possible. Sign shops in Las Vegas recognize that Las Vegas is the leader in conventions and trade shows and that signs and banner stands are needed for these shows. Often, these signs and banner stands are needed at the last moment because it seems that the convention booths are set up at the last moment for these shows and that is when the damaged or missing display graphics are noticed. 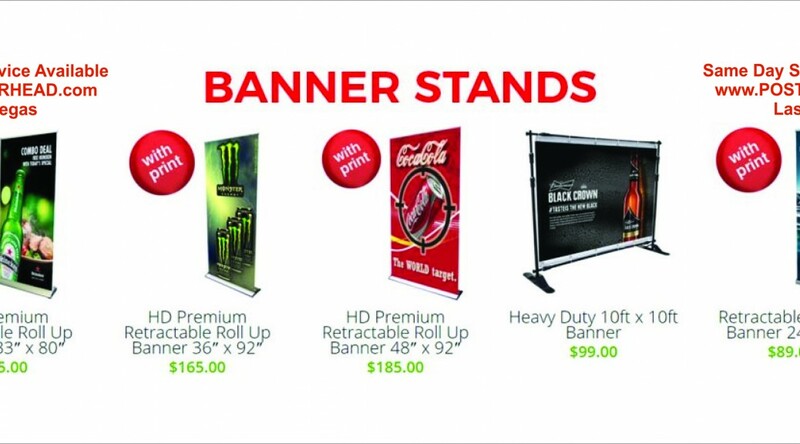 These fast banner stands can be found on websites like www.posterhead.com . Banner stands in 48 hours or sooner in Las Vegas come in many different sizes and shapes. The most popular banner stand at the many Las Vegas events is the 33″ x 78″ banner stand with the adjustable pole for height. (The inferior version offers a fixed pole with no height adjustment capability ). This adjustable pole allows for the perfect height. However, there are many versions of the banner stands that allow for widths of 24″ all the way up to 57″ wide and banner heights of 78″ to 92″. Premium and economy versions of the banner stands are available. All these banner stands offer a full color eco solvent banner print that attaches to the stand. The cost of the banner stands start off at less than $100 and tops out at the mid $100′s for the large premium versions. All the banner stands come with a convenient carrying case for easy transportation. Often, the banner stands can be made in the same day and delivery is available through most sign shops. 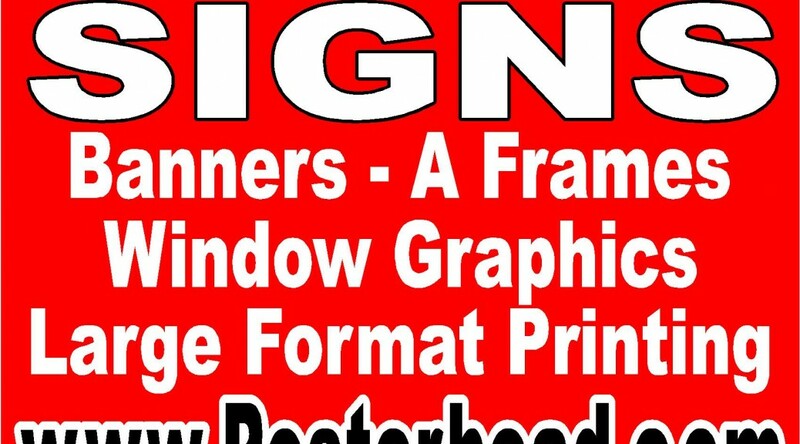 Sign shops in Las Vegas want to help you with your convention print needs and compete for that privilege. Not all sign shops in Las Vegas service the convention and trade show industry. A quick internet search will lead you to the right sign shop that most likely is close to the convention venues. Clark County dust permit signs in 24 hours can get you out of that jam when you need a dust control sign for Henderson, Mesquite, Las Vegas, North Las Vegas and other areas of Clark County. The Clark County Air Quality Management Board ( http://www.clarkcountynv.gov/airquality/Pages/default.aspx ) regulates the air and requires dust control signs on jobsites where dirt is going to be moved around. The purpose of this is to try to limit the amount of dust into the air. The Clark County Dust people take it very seriously and monitor your jobsite and require lots of things, including an educational class. Part of the requirements include ( but not limited to) a dust control sign to be posted on the jobsite. A 4ft x 4ft dust control permit sign is required for properties 10 acres or less and a 4ft x 8ft dust permit sign is required for properties exceeding 10 acres. The dust signs require certain language, text size and information on the sign to be in compliance. Most sign shops use an aluminum sign or a wood sign to make the dust permit sign. The newer style aluminum signs double sided with a filler material in the middle that makes it rigid. It is lighter than a wood sign and does not weather like a wood sign. Also, it happens frequently at jobsites that the dust sign will get run over by a piece of machinery. While the wood sign will crack and require replacement, the aluminum sign is merely straightened out and then placed back on the supporting structure. Clark County dust permit signs in 24 hours are not expensive. The 4ft x 4ft aluminum dust sign is $99.00 and the 4ft x 8ft dust sign is $175.00. These signs can be found at www.Posterhead.com and can be made quickly. Your pdf from Air Quality needs to be sent with the information needed on the sign and then it is put into a template and returned to you for approval. Las Vegas dust control signs in 24 hours can be made within 24 hours if you absolutely have to have one. Sometimes things happen on jobsites and people need fast signs. Well, there is a company at www.Posterhead.com that can get you that dust permit sign in a hurry. As you are aware, the Clark County Air Quality Management Board regulates the dust at construction sites where dirt is moved and has the potential of going into the air. While no one likes to breathe dust in Las Vegas, the nice people at Clark County Air Quality has interfered with many rules and regulations. Part of the rules is that a dust sign is mandated at sites they deem fit. There are 2 types of signs, a 4ft x 4ft sign for construction sites involving less than 10 acres of land and 4ft x 8ft for construction sites that have more than 10 acres of land. Las Vegas dust control signs in 24 hours are not expensive. The 4ft x 4ft dust control sign is less than $100 and the 4ft x 8ft dust control sign is less than $200. ( actually it is $175.00 ). These dust permit signs that are required by Clark County are made with aluminum panels with a filler substrate in the middle to make them strong and rigid. The older signs were made with wood which would rot and get damaged at job sites during construction. Most construction companies prefer the aluminum signs because they are lighter and can take more abuse than the wood signs. Depending on the situation, many times the dust sign can be made the same day at no extra cost. Contact your local sign company today for your dust control permit sign and be in compliance with the rules and regulations of the Air Quality management Board of Clark County. November 27, 2017 Robert W.
Las Vegas convention wholesale signs and banners can be yours in Las Vegas. There are many sign companies that offer wholesale printing of signs and banners for the many conventions that occur in Las Vegas. Sign companies like www.LasVegasLargeBanners.com or www.Posterhead.com can make those banners and signs and very low cost. Millions of people come to Las Vegas every year for the conventions and trade shows. Las Vegas is the number one destination in the world for shows and events because there is so much fun to be had and the town is set up for treating visitors like royalty. The convention season is traditionally during the winter season ( but many conventions and trade shows happen year round) and everybody likes to get away from where they are from and come to a moderate climate. Also, besides the moderate weather Las Vegas experiences during the winter season, there is 24 hour fun to be had. There is fine dining, shows, gambling, and great hotel accommodations at very reasonable prices. With 2 large convention and trade show venues with millions of square feet of floor space, its no wonder everybody want to hold their convention in Las Vegas Nevada. Las Vegas convention wholesale signs and banners are made using state of the art sign making equipment. One of these tools is the large format printer capable of printing several hundred feet of sign material an hour. These modern day marvels are using 8 colors to make sure that your design colors are vibrant and bold. In addition, many sign companies have low operating costs because of these printers and pass the savings onto the customer. Many of these signs and banners can be made in a single day and sign shops in Las Vegas offer amenities such as delivery and set up at the conventions.